‘Some say, compar’d to Bononcini / That Mynheer Handel’s but a Ninny. / Others aver, that he to Handel / Is scarcely fit to hold a Candle.’ Satirised in John Byrom’s poem, the more-or-less friendly operatic rivalry between Handel and Bononcini was whipped up by their partisans into an acrimonious feud. Both composed prolifically for London’s Royal Academy of Music in the early 1720s; then, as Bononcini’s fortunes began to dip, the Academy engaged the Bolognese priestturned-composer Attilio Ariosti. Like the Handelian faction in the 1720s, we now take Handel’s superiority for granted. 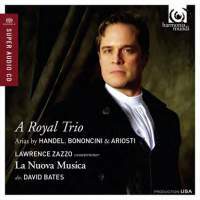 Yet, as Lawrence Zazzo and David Bates’s superbly responsive period band confirm, the two Italians were skilled operatic professionals whose best numbers could easily pass for Handel. Music historian John Hawkins summed up Bononcini’s style as ‘tender, elegant and pathetic’: epithets apt to the doleful aria from Crispo (with a touching – and touchingly played – cello solo) and the suave minuet song from Griselda. Zazzo’s limpid delicacy, and control of nuance within a long-spun line, is as impressive as his bravura exuberance in Ariosti’s ‘shipwreck’ aria, ‘Freme l’onda’. Even finer is the sombre prison scene from Ariosti’s Coriolano, admired by Rameau, no less. A natural theatre animal, Zazzo ‘lives’ each phase of the grieving accompanied recitative, always alive to the sound and meaning of the words, and phrases and colours eloquently in the aria that follows. A minor gripe is the slightly haphazard ordering of items. Why, for instance, do we have a fizzing Sinfonia from Handel’s Admeto between a Bononcini aria (from Muzio Scevola) and ‘Vivi, tiranno’ from Rodelinda? And Zazzo surely misses a trick by not including one of the arias Handel contributed to the collaborative Muzio Scevola. That said, I enjoyed this snapshot of London’s operatic life almost without reservation. Zazzo and the players – not least the fabulous horns – have all the boldness and virtuoso panache one could wish for in the extrovert arias, culminating in a show-stopping ‘Vivi, tiranno’. Even more memorable are the sorrowful and reflective numbers, not only the prison scene from Coriolano but also Ottone’s despairing ‘Tanti affani’ and the ‘sleep’ aria from Admeto, sung and played with exquisite hushed tenderness. The breadth and expressive depth of these numbers, and of the famous ‘hunting’ aria from Giulio Cesare, do indeed clinch Handel’s superiority. But the gap between the great man and his operatic rivals is not as wide as history has decreed.